Android: The Land that Python Forgot? I was one of the invited presenters at the second PyCon Canada in Toronto. My talk, “Android: The Land that Python Forgot?” looked at the state of Python development on the Android platform, and how we can improve things. The recording of the talk is available on YouTube and annotated slides are available at SpeakerDeck. As for PyCon Canada itself? Well the conference itself was fantastic — a friendly, enthusiastic organising team, really good talks, and a beautiful host city. I’m really looking forward to returning to Canada next year when the US PyCon moves to Montréal in April. 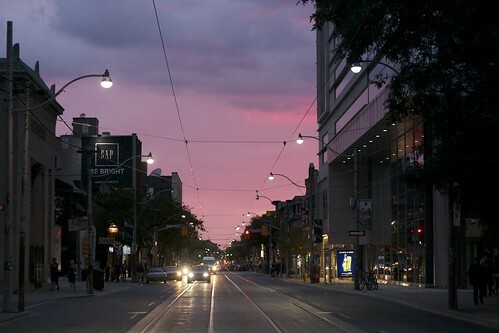 A Toronto Sunset down Queen Street, very close to the conference venue.